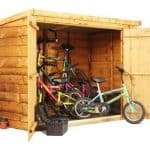 It does not matter if you purchase the 7′ x 3′ Store-Plus Overlap Bike Shed as a way to keep your own or the kids bikes safe or even as a way to add some more storage space to your garden, you are going to be very happy with this shed. This is a shed that invites you to place all your items inside with two large double doors and offers a very generous amount of storage space inside. 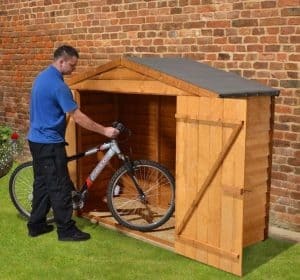 The shed somehow manages to offer a good amount of room for you to store things without the need to take up a huge area of your garden. Making this a shed that is not only ideal for people who are on a budget, but also people who have a garden that lacks a lot of space. This is a shed that is very easy on the eyes, with its classic looking, 8 mm thick overlap cladding providing a good looking shed as well as one that is well prepared to take on our harsh winters. The apex roof is designed to let the water flow off the sides of the shed to keep everything inside nice and dry. The flooring is very impressive with pressure treated floor joists and strong floor boards being up to the task of taking a lot of weight. While Store-Plus may be calling this a bike shed we feel that this actually would make for one fantastic addition to a garden that is looking to add some extra storage space and not just be used exclusively for bikes. It is a great size where it offers you a very decent amount of storage space inside, but it does not really take up a lot of room in a garden. 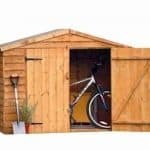 This makes it a shed which would be ideal for a garden that is lacking in space or even for a garden where there is already a shed, but you want to add a little bit more storage. 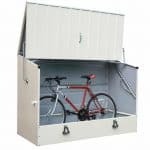 The dimensions inside the shed are a depth of 2 feet 9 inches and a width of 6 feet 8 inches which offers you plenty of room to store a bike, mower or whatever else you may need this extra storage space for. Height wise at the ridge it is 5 feet 2 inches which may not seem a lot, but this is not the kind of shed you will be walking around in anyway. It is more of an, open the door, reach in and grab what you need type of shed. The apex roof looks good and it has been put at the right kind of angle to make sure any rain will just drip right off the sides of the roof rather than fall off the front onto you. Store-Plus have used some very good roofing felt on here to cover the 8 mm thick resin bonded boards that make up the roof. In all we are very pleased with how this roof looks and the great protection from the rain it provides. The overlap cladding that has been used to make the shed walls looks very high class. It looks like it could easily be used on a shed that is twice the price of this one. Overlap cladding we feel has that perfect balance of being very pleasant to look at, but also making sure no rain gets inside. At 8 mm thick this cladding is more than tough enough to take the odd bang and whack from a bike being placed inside or when you take out the lawn mower. We are sure that the overlap cladding along with the 28 mm x 28 mm frame is going to make this a shed that will easily last you many years. This frame has been crafted with some fantastic wood which is very durable and up to the job of taking a bit of abuse over the years. Be it from you just throwing things into the shed or even the kids booting a football off it from time to time. Perhaps the most impressive part of the Store-Plus Overlap Bike Shed is the flooring that they have used. The floor boards are those exact same ones that are used for the roof. The 8 mm thick, resin bonded boards that are very strong and can take a lot of weight, but what makes this a floor that can easily handle a bike, mower and anything else heavy is the floor joists underneath the boards which have been pressure treated to make sure they can handle a lot of weight and keep those floor boards solid for a lot of years. The shed will be dip treated before it is sent your way, but once built we always think you should right away give it a coating of wood treatment. This sets your new shed off on the best foot forward, but it also gets you used to having to do this once per year to ensure your shed will last for many years. Store-Plus offer you a ten year anti rot warranty. We feel that if you do your annual treatment of the shed that you will never have any reason to use this warranty, but it is still a good peace of mind to have. 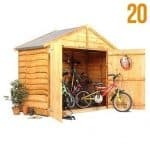 Being designed with being a bike shed first and being used for general storage second, the Store-Plus Overlap Bike Shed has a great set of double doors which make getting things like an adult sized bike in and out very easy. The doors give you a very impressive 4 feet 4 inches of width and 4 feet 1 inch of height. Each door is held in place with top quality hinges which will prevent them from sagging over the years. 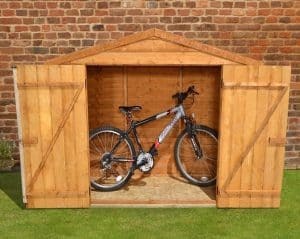 This is a shed which takes great pride in keeping your bike or whatever else you may be using it to store out of sight. So with that in mind, Store-Plus have not put any windows on the shed. The double doors come with a hasp and staple to keep them secured. This is a great way to keep those doors closed, but if you want some extra protection and to make sure not even the fiercest wind can blow it open then add a padlock which is inexpensive and easy to do. Everything you place inside this shed will be kept away from people keen to know what’s inside. No one will have any idea of all the great stuff you have inside here thanks to the ways the doors shut securely and the lack of windows. The best way to add a bit of life to the shed and give it your own kind of personal flare is by picking a wood treatment that is coloured. 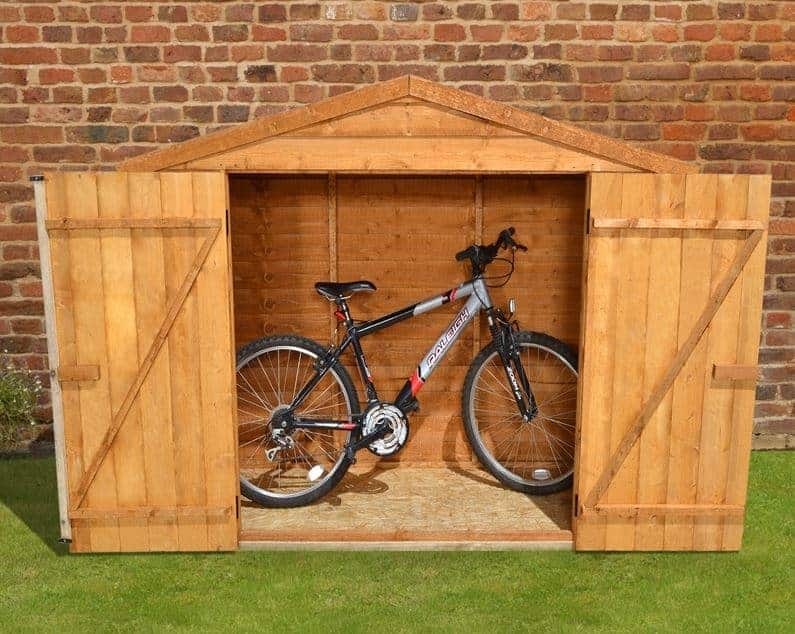 We love this as you can protect your shed and put your own little bit of style on it as well. 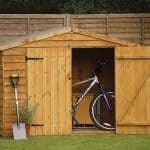 The wood treatment and a padlock are the only extras that you need to consider when purchasing this shed. No hidden extras with this shed, you get everything else you need when it is delivered which makes this just such great value. When you see that low price, you may think this is a shed that is lacking in the quality department. We are happy to tell you this is not the case at all and even at this low price you are getting a high quality shed. With just the right amount of TLC and carefulness when you place things in and out of the shed, you will be able to use this for a very long time. It may not be the largest shed, but we do think that for this price this adds some fantastic extra storage to your garden. It should take you and a friend no more than three hours to put this together. We feel that building this shed, if you follow the instructions and are sure to break for coffee and biscuits, will be quite the fun experience. Being just over the £150 mark makes this a shed that is excellent value for money. 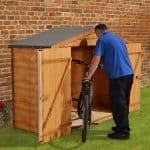 Final Thoughts: The storage space that this fantastic compact 7' x 3' Store-Plus Overlap Bike Shed offers is sure to make keeping your garden tidy and your bikes or other items safe from thieves, easy and very cheap. 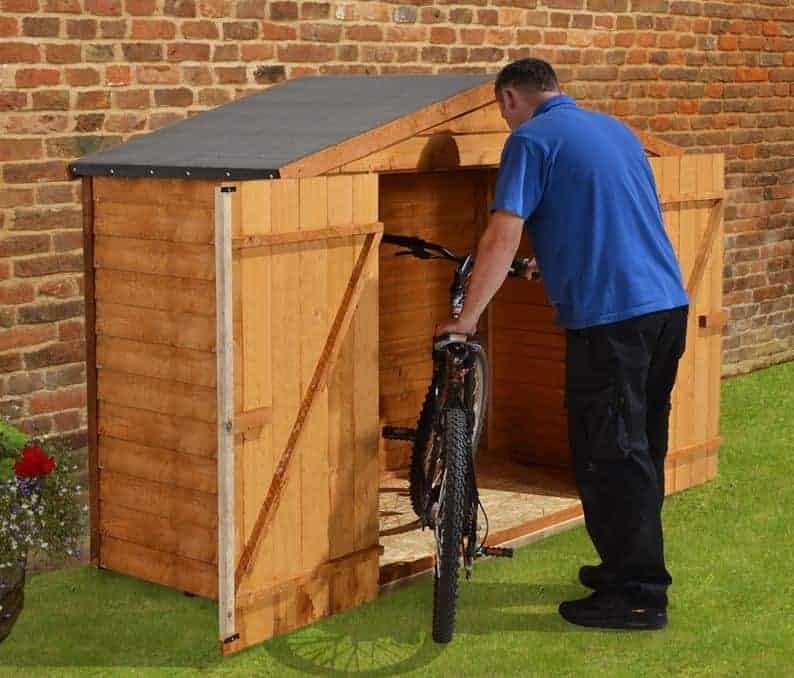 This is a great deal at £169.99 and we feel that if you are looking to add an affordable way to keep your bikes out of the rain, children’s toys of the lawn or even as a space to keep your tools organised, that this shed will do an amazing job. 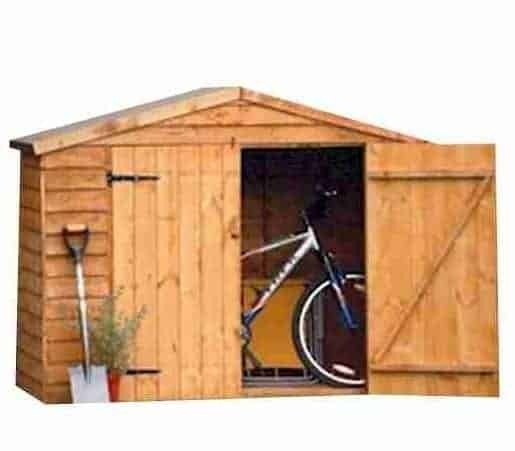 Being low priced, but still high quality make this a shed we can easily recommend.